There are two solutions for replacing missing teeth; these involve separate crowns on dental implants or a bridge attached to several dental implants. 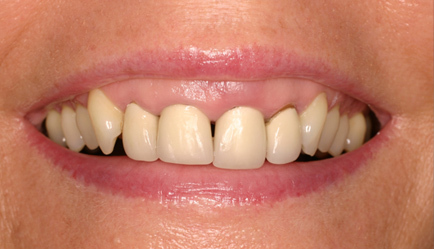 This unattractive ‘gummy’ smile with failed crowns (all hopeless teeth) was treated by extracting the four front teeth and providing an all ceramic Zirconia bridge supported on two implants with Zirconia abutments. The gums were reconstructed and micro reshaping performed to re create the ideal gum form, essential to a natural perfect smile. May I take this opportunity to thank you, Fiona and your team for the excellent implant treatment I have received. I came to your practice with very poorly fitting crowns to all four incisors, along with an ongoing infection and as a result, my confidence was at an all time low. 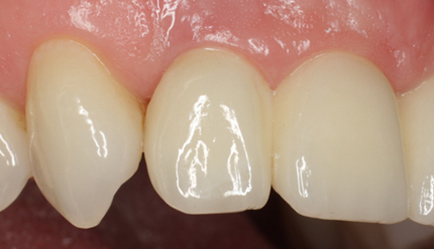 I now have a beautiful Zirconia bridge on Zirconia abutments, that look and feel just like my ‘natural’ teeth. I am more than delighted with the results, which are little short of incredible! The first step we undertake in relation to dental implant therapy is to sit down and discuss your aims and concerns for the objectives of your treatment. We take a complete x-ray of your jaw to check the condition of the bone tissue and to determine the placement of the dental implant. 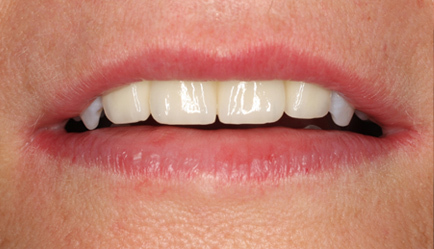 We make an accurate impression of your jaw and existing teeth, this forms an important platform for the treatment. There are two options for the dental implant placement, the choice of these is heavily dependant upon your clinical situation. The first option is the one-step procedure, this requires the dental implant to be put in place and a temporary abutment is attached. The second option is the two-step procedure, the dental implant is installed and then we cover it with the gum. The abutment is attached at a later date. In both cases, a temporary tooth or prosthesis is put in place, this is followed by a maximum healing period of three months for the lower jaw and six months for the upper jaw. In some cases, the new dental implant can be loaded immediately although this does depend on the condition of your bone. In the case of the one-step procedure, after the dental implant has bonded with the bone tissue the temporary abutment is replaced by a permanent one. The two-step procedure requires a second stage which involves us making a minor incision into the gum to open it up and put the abutment in place. Once the abutment is in place, a new impression is made, we then compare it with the impression we made during the initial examination. From this examination we develop a final model of your jaw and implant, our experienced dental technician carefully crafts the crown, bridge or prosthesis that will sit on top of the implant. Considerable time and attention is spent ensuring we match the right colour and shape of your new teeth so they blend naturally with your existing teeth to create your new smile. Once the carefully crafted tooth has been created and examined by us, we attach it to the dental implant. We follow up any implant procedure with a few follow-up visits to check the functionality and aesthetics and to make sure you are completely satisfied with your new tooth. An important factor in the healing period is the general state of health and the quantity and quality of your bone tissue. These factors determine the total duration of the treatment. We will be able to give you an indication of your specific situation from our initial detailed examination. 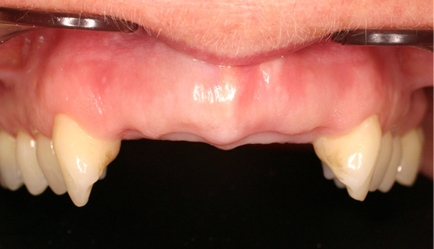 Teeth loss can occur at the back of the mouth, this is typically caused by gum infection (periodontitis) or by teeth cracking due to previous fillings. A solution for replacing several missing teeth is to install a dental implant bridge consisting of two and four dental implants. 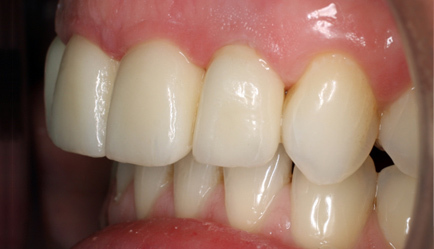 With this solution your own existing teeth are not affected and the bridge will function for many years, regardless of the condition of your existing teeth. At this stage the abutments are attached to the dental implants, the next step is to fit a bridge; this is where we carefully attach the new set of teeth onto the abutments. With the dental implant bridge in place; the replacement teeth can withstand the strong chewing forces that occur in the back of the mouth and they feel and function like natural teeth.